Stream Doe B's Posthumous Mixtape "Definition Of A Trapper 3"
Stream Doe B's posthumous project "Definition Of A Trapper 3" in its entirety below. Back in December, we found out the tragic news that Hustle Gang rapper, Doe B, was taken away from us entirely too soon. The Montgomery, Alabama rapper had a lot of work that was unreleased, and today, the third installment in his D.O.A.T. (Definition Of A Trapper) mixtape series was released. While we've already heard a few singles off it with "Turn Up" and "Betta Kno It", we now can stream the rest of the 18-track mixtape for free thanks to livemixtapes. 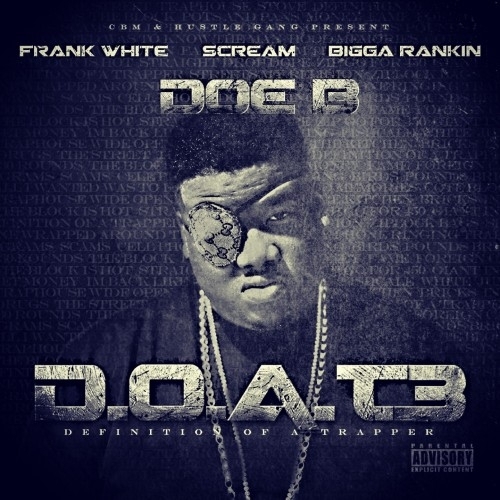 The DJ Frank White, DJ Scream, and Biggie Rankin-hosted project features guest appearances from T.I., Spodee, Kevin Gates, Boston George, Young Dro, Trae Tha Truth and more. Production on it is handled by Karltin Bankz, Zaytoven, KE On The Track, M16 and more. The deluxe version features 24 untagged tracks, and is available for purchase on D.O.A.T. 3 (Definition of a Trapper) [Deluxe Edition] - Doe B">iTunes HERE. Stream the new mixtape below, and check out the official artwork below.